How to unlock Alcatel 4060A by code ? Unlocking Alcatel 4060A by code is the easiest and fastest way to make your device network free. It doesn't interfere in your system or change it in any way so even after using our code, you don't loose your warranty. In order to receive a network unlock code for your Alcatel 4060A you need to provide IMEI number (15 digits unique number). It can be found by dialing *#06# as a phone number, as well as by checking in the phone settings of your device. Network unlock for Alcatel 4060A never was so easy. 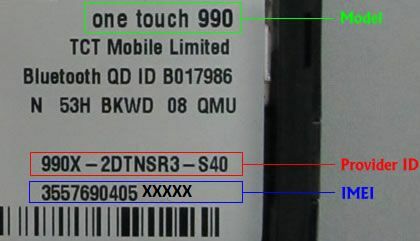 Alcatel 4060A require not only the IMEI number but an ID provider (special sequence of numbers and letters) which can be found on the sticker under the battery or in the phone settings. Alcatel network unlock codes guaranteed! BigUnlock.com Will Generate unlock codes for your Alcatel easy and fast. USA, Canada and Mexico Carrier Best price guaranteed your Alcatel unlocked or your money back. We are sure to unlock any Alcatel using this service. Regardless the the original carrier of your Alcatel. Our Alcatel permanent official factory unlock network process is safe, easy to use, simple and 100% guaranteed to unlock your Alcatel! This is the same method Networks and Carriers will use and charge you much more money to unlock your Alcatel. Once you receive our Alcatel unlock code and easy to follow instructions, your Alcatel will be unlocked within 5 minutes and be using a SIM card of your choice! Our automated system delivers fast and accurate results and will process your order and send your Alcatel permanent official factory unlock code via email for fastest results. we guarantee 100% that no one will be faster and have a lower price than unlockfusion.com. Simple the best services at the best prices. If you need to unlock larger quantity of Alcatel please register to get unbeatable prices. Unlock Fusion the leading #1 phone unlocking company in the industry today. If you are processing more than Alcatel permanent official factory unlock network requests at once please contact us for more discounts. Unbeatable prices are available if volume. Turn off your AT&T Alcatel Ideal 4060a phone. Turn on your AT&T Alcatel Ideal 4060a phone. AT&T Alcatel Ideal 4060a phone will ask for Network Lock Control Key or Unlock Code. Enter AT&T Alcatel Ideal 4060a Unlock Code. 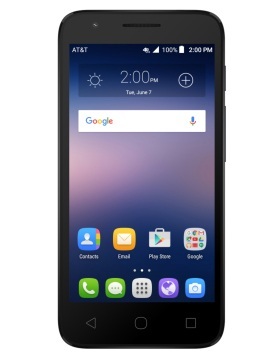 Now AT&T Alcatel Ideal 4060a phone is Unlocked.